The traditions vary as to the place of martyrdom, two different opinions being expressed: Symeon Metaphrastes and the Latin legend given by Mombritius makes Heliopolis in Egypt the site of the martyrdom, while other accounts, to which Baronius ascribes more weight, give Nicomedia. In the "Martyrologium Romanum parvum" (about 700), the oldest martyrology of the Latin Church in which her name occurs, it is said: "In Tuscia Barbarae virginis et martyris", a statement repeated by Ado and others, while later additions ot the martyrologies of St. Jerome and Bede say "Romae Barbarae virginis" or "apud Antiochiam passio S. Barbarae virg.". These various statement prove, however, only the local adaptation of the veneration of the saintly martyr concerning whom there is no genuine historical tradition. It is certain that before the ninth century she was publicly venerated both in the East and in the West, and that she was very popular with the Christian populace. The legend that her father was struck by lightning caused her, probably, to be regarded by the common people as the patron saint in time of danger from thunder-storms and fire, and later by analogy, as the protector of artillerymen and miners. She was also called upon as intercessor to assure the receiving of the Sacraments of Penance and Holy Eucharist at the hour of death. An occurrence of the year 1448 did much to further the spread of the veneration of the saint. 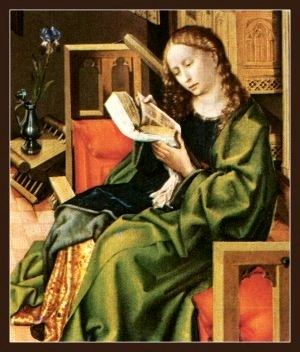 A man named Henry Kock was nearly burnt to death in a fire at Gorkum; he called on St. Barbara, to whom he had always shown great devotion. She aided him to escape from the burning house and kept him alive until he could receive the last sacraments. A similar circumstance is related in an addition to the "Legenda aurea". In the Greek and present Roman calendars the feast of St. Barbara falls on 4 December, while the martyrologies on the ninth century, with exception of Rabanus Maurus, place it on 16 December. 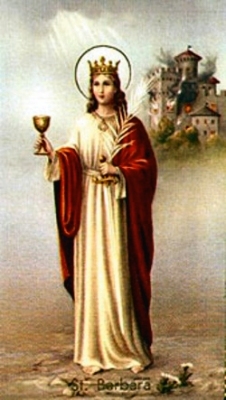 St. Barbara has often been depicted in art; she is represented standing in a tower with three windows, carrying the palm of a martyr in her hand; often also she holds a chalice and sacramental wafer; sometimes cannon are displayed near her.